What are your energy efficiency goals ? We will complete a systems-based analysis of your homes energy performance BEFORE it is built. 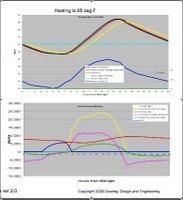 We specialize in thermal simulation and analysis of residential buildings. The results of these studies lead naturally to a cost analysis of your building design. Efficiency Monitoring Systems for POST-Construction.